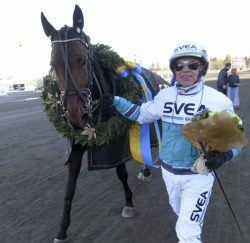 Propulsion driven by Ôrjan Kihlström returned to action Saturday afternoon (April 13) in Sweden. This was his first race since he started in the Prix d’Amerique back in January. Propulsion wins the Guldbjörken at Umåker in Northern Sweden after losing two shoes prior to the start. Kanal 75 photo. Propulsion went to post as the 1-10 favorite in the Guldbjörken at Umåker in Northern Sweden, but the way to the winner’s circle was not as easy as expected. While scoring down Propulsion lost a shoe. That was fixed in due time, but just shortly before the start, Propulsion lost another shoe. The shoe was found, but it was not an easy task for his trainer Daniel Redén to put the shoe back on. He managed, however, and Propulsion went to post. The race was over 1/5-16 miles and although Propulsion was parked most of the trip outside leader Muscle Hustle with Robert Bergh in the bike, the 8-year son of Muscle Hill proved to be on top of his game and won easily in a new stakes and track record of 1.54.4f (mile rate). Propulsion, who also won this race two years ago, picked up the winners purse of $21,500. In Finland, there was a purse for the winner of $80,000 dollars in the Seinäjoki race. Pastore Bob and Jihan Untersteiner of Sweden were in command most of the event and looked like winners going down the stretch. However, in a photo finish, Atupem and Santtu Raitala just managed to get the nose in front to win in a new track record of 1.55.3f (mile rate). Atupem is a 6-year old trotter sired by Andover Hall, and this was by far his biggest win ever.